I'm in love with IMAN Luxury Liquid Eyeliner $10.99. Available in Platinum, Onyx, Copper and Sapphire. With my recent love affair with sequins, glitter, shiny things, and Michael Jackson, this is the perfect lil' cosmetic accessory. Lighter to carry than any mascara or lipgloss, but certainly not a light weight. 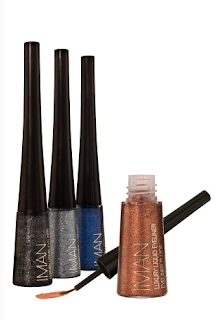 These IMAN Luxury Liquid Eyeliners $10.99 carry a serious punch! Perfect for either your uptown party or downtown lime this holiday season! ... And don't forget Trinidad Carnival 2010, 'round the corner! Apply to the inner corners of your eyes, or one stroke to the entire eye ... even wear all four shades simultaneously!! Think stocking stuffers for your girlies!!! !